Pressure Cooker Spaghetti is an easy dinner? Keep the ingredients on hand for a last minute meal. Everything goes all at once into the Instant Pot and it all cooks together to make a yummy pasta dish. A perfect one-pot meal. Once again the Instant Pot comes to the rescue. My family loves this Pressure Cooker Spaghetti. Don’t worry about timing, in 8 minutes at high pressure the noodles had cooked perfectly in the sauce and the meatballs were nice and tender. Change this recipe up by browning a pound of hamburger or sausage in place of the meatballs. If noodles are too al dente after 8 minutes on manual, replace the lid and cook for 2 more minutes. Be sure to use a good quality flavorful pasta sauce. We actually love the traditional sauce at Aldi’s. This recipe is perfect for busy families. Keep all the ingredients in the pantry and meatballs in the freezer and you can have dinner on the table in less time than it takes to run through a drive-through. When I have more time I saute one onion and 2 -3 cloves garlic and add it to the pressure cooker. If you like to cook your pasta and sauce separately we love this Instant Pot Spaghetti sauce. It makes a ton so I divide the recipe in half as I am making and place half the ingredients in a freezer ziplock bag and freeze for another meal. I get two for one! How long does it take to cook pasta in the pressure cooker? Not long! 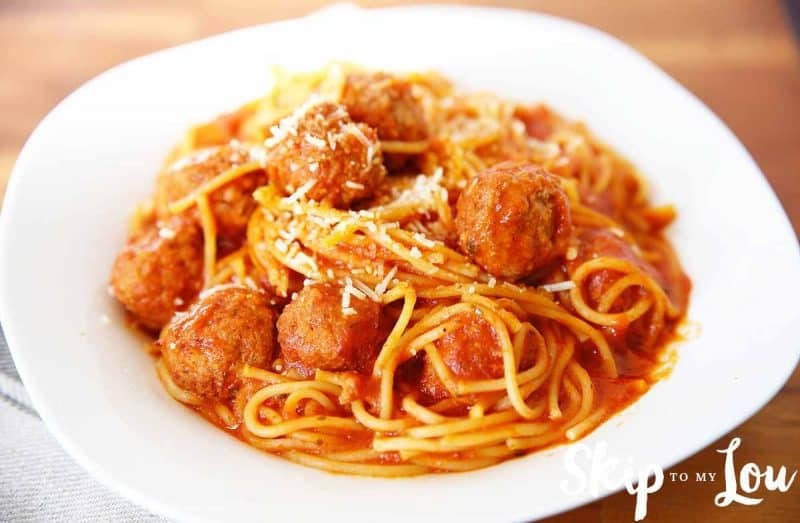 For this recipe, we are making the whole complete dish spaghetti and meatballs in 8 minutes. The higher temperature inside the pressure cooker allows foods to cook in about one-third less time than regular cooking times. You can cook the pasta in less time, with less water, and still have tender delicious noodles. To cook pasta place dry noodles into the Instant Pot insert and cover with water. Use just enough water to cover the noodles. Cook spaghetti, linguine or elbow macaroni for 6 minutes on high pressure. Pasta shells, egg noodles, and bow pasta 5 minutes. When only cooking pasta, a good rule of thumb is half the cooking time listed on the box. I keep this handy Instant Pot Cooking times chart inside my cabinet as a handy reference guide. So much to like about this pressure cooker spaghetti! 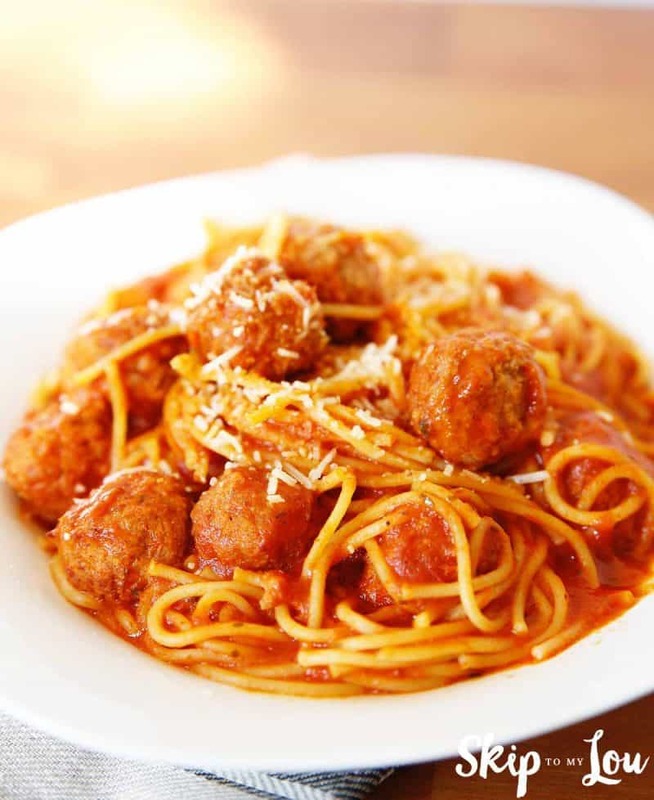 Try this spaghetti and meatballs recipe or any other recipe and let me know what you think in the comments below, I love hearing from you! You can also follow me on Pinterest to see more delicious food. See what I am up to on Facebook and Instagram. Keep frozen meatballs, spaghetti and jarred sauce on hand to make a family-pleasing meal in minutes. Place frozen meatballs in bottom of instant pot insert and add 1 jar sauce. Break spaghetti noodles in half and add to pot, pour in second jar of sauce. Fill one jar completely full of water and pour into the pressure cooker. Cook on high pressure for 8 minutes. Quick Release. Remove lid and stir. Serve with a veggie loaded salad and dinner is complete! Be sure to use a good quality flavorful pasta sauce. We actually love the traditional sauce at Aldi's. We really like pasta pressure cooker recipes! 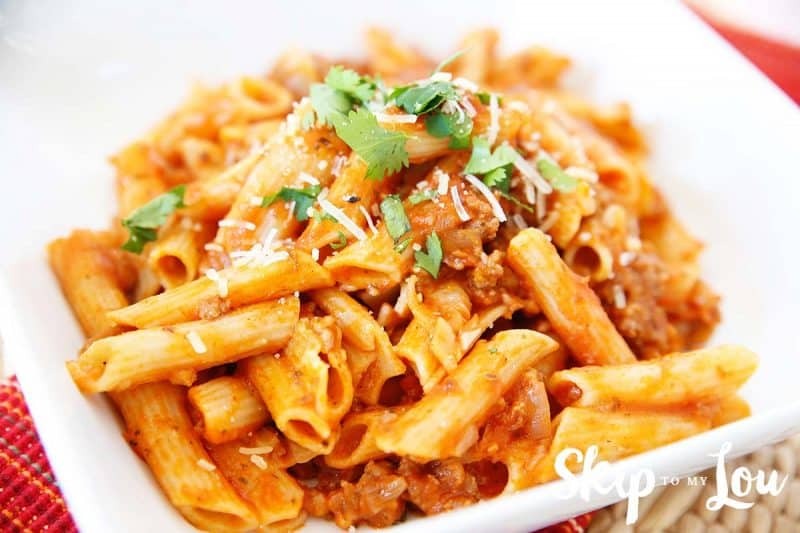 This Gluten Free Pressure Cooker Pasta with Meat Sauce is also a regular on our meal rotation. It is nice when all the ingredients cook at one time! While the pasta is in the Instant Pot I make a salad so once the cooking is complete we are ready to eat! Don’t miss all the pressure cooker recipes we enjoy! It truly makes meal time a breeze. Don’t forget the dessert! This is why a second insert is a must for us. After dinner is done we can slip in a dessert like Pressure Cooker Pumpkin Bundt Cake and let it cook while we eat! I have cooked extensively with both the Instant Pot and the Cuisinart Pressure Cookers. In head to head cooking, we have found they both cook about the same. Some people feel that the Cuisinart is easier to use right out of the box, however, I feel the Instant Pot is easy to learn. For me, the main difference is the inner cooking pot. The Instant Pot has a heavy stainless steel pot that can even be used on the cooktop. The Cuisinart has a non-stick coating and I have noticed this starts coming off. I also love that the Instant Pot counts down after cooking so you can time natural release easily. I have this Instant Pot. My crockPot, i think 6/1. Does not have spaghetti. 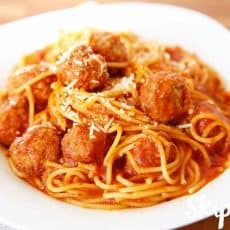 What would i cook under for spaghetti? I'm new to Instant cooking and having been trying simple recipes that hopefully my husband and kids will like. I used 1 jar of Barilla marinara, 1 28oz can of Tuttorosso crushed tomatoes and frozen turkey meatballs. It came out perfect after 10 minutes. Super tender meatballs and pasta infused with flavor. I can vouch for this recipe, it is quick and easy to make, tastes great and the kids love it! I followed this recipe exactly and got the burn notice after it almost reached pressure. Is there something I should’ve done to prevent this? And how do I get it to go away so I can continue cooking? What about the Ninja Instant Cooker? I don't know much about that but if it is a pressure cooker it should be fine. I tried making in my instant pot, followed the recipe but didn't add a full jar water only 1/2. After the pot heated up and sealed after a few minutes "burn" showed on the screen. I opened and stired the pot and started again and got the same message turned off and opened and stired again meat balls did burn a little. Don't know what happened, guess I should have used full jar of water. You need more water for sure. Use the full jar. I just recently bought a pressure cooker and used this recipe for my first meal in it and my family loved it. Thank you! I add a can of tomato soup it seems to bring the sauce flavor back up a notch. Mary, I worry it might be too much for the Instant Pot to double. This recipe was great... I agree with Cindy who said to replace the lid and cook for another minute or two. Because all pressure cookers are different, 8 minutes did not do the trick for me. However, I did replace the lid and cook the noodles a little more and everything came out just fine. I followed your spaghetti and meatball recipe to a T, but the noodles were a tad undercooked. Next time I will use either thin spaghetti or add two or three minutes to the cooking time. Yes, Diana... all pressure cookers are slightly different. Another minute will probably do the trick. Also, don't be afraid to open the pressure cooker and test the noodles, and then replace lid and give it another minute if needed. I made this but think the addition of the water really diluted the flavor of the sauces. Very bland. Shirley, make sure you use a really flavorful sauce. Also, don't be afraid to spice it up with 1/2 teaspoon of Italian seasoning or other spices your family might like. Can I cut this recipe in half, but use the same cook time? Melissa, yes, use the same cook time. I never cooked spaghetti in a pressure cooker. I think I need to try this one pot meal very soon. I don't have the Instant Pot - can I do this in my regular pressure cooker? I got it for Xmas, but have yet to use it. And you keep posting these great Instant Pot recipes - I thought I may try some, but don't want to get another pressure cooker. Hi Helen, I think it would work fine in any electric pressure cooker. Helen, should work in almost any pressure cooker/non electric as well, times may vary, but I think no more than 10 minutes would do the trick. The wonderful thing of electric is the speed at which they come to pressure, and if not done then replace the lid and cook some more, did that with a meal the other day cooked like 20 minutes and it needed like 5 more. Plus, Electric , at least mine sounds an alarm when finished cooking and automatically shuts off and moves to keep warm. I can set it for a meal go to work and it's done when I get home.